"So sorry for your loss, it was a pleasure to have known Frank." 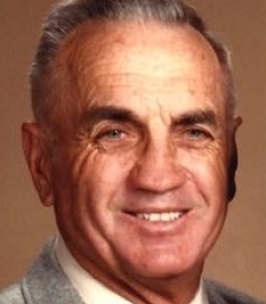 Franklin F. Costello, 93, of Springfield, passed away Sunday November 4, 2018. He was born June 12, 1925 in Greene County, MO to Lemuel and Constance Costello. After attending Fair Grove High school, Franklin joined the United States Navy serving as a Pilot during WWII. After the service he owned the DX truck stop on route 66. Following that he became a Postal Carrier and retired after 42 years. During the same time he owned The Dog ‘N’ Suds Restaurant on N. Glenstone for 12 years and did upholstery work, worked for a tent and awning company and raised registered cattle. He also planted a 6oo tree peach orchard for his retirement. He loved to hunt, fish, and play golf. He was very active in his church where he made a lot of their furniture. He loved his family, he had supper with one of his sons every night. Franklin was preceded in death by his wife Waunetta in 2009 and 3 brothers. He is survived by 3 sons, Joe and Leadra, Lynn and Barbara all of Springfield, and Bill and Patty of Republic, MO. He is also survived by 7 grandchildren and 7 great grandchildren. Services will be at 1:00 pm Wednesday, November 7, 2018 at Greenlawn Funeral Home East with visitation from 12:00 to 1:00 pm prior to the service. Interment will be in Missouri Veterans Cemetery. To plant a tree in memory of Franklin F. Costello, please visit our Heartfelt Sympathies Store. We encourage you to share any memorable photos or stories about Franklin. All tributes placed on and purchased through this memorial website will remain on in perpetuity for future generations. So sorry for your loss, it was a pleasure to have known Frank.